This plain (no stamping) sterling silver domed, backed, bracelet measures approximately 3/8" wide and is made by Navajo artisan Harrison Chee. 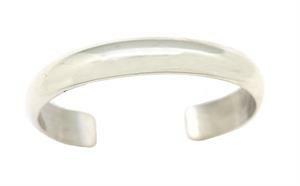 It is a 5 1/2" wrist size with 1" opening. It can not be adjusted.